Ah, this is how you do it. 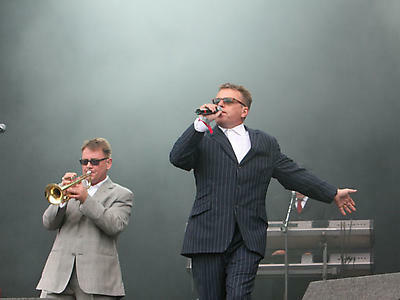 As the mud deepens, Madness take the stage to today’s biggest cheer. And, proving perhaps that there is a God after all, the sun pokes through the gloom to add some extra cheer. Indeed, there’s considerable good will directed to Madness. 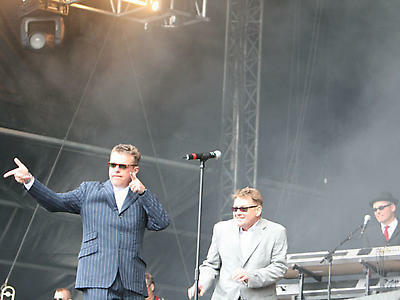 They’re one of those bands who carry such residual affection among people of a certain age, all of whom would happily let Suggs question their paternity if he then played “One Step Beyond”. Which, coincidentally, is what they open with. What follows is a fine celebration of what one of the most impressive back catalogues I can think of. “Our House”, “You’re An Embarrassment”, “Baggy Trousers” and on it goes, each one a burst of three-minute pop fun, bright and shiny as Suggs’ suit. And, accordingly, there is much good-natured throwing of mud as grown men and women roll merrily in the mud to the sound of “My Girl”, “Night Boat To Cairo” and, the biggest singalong of all, “It Must Be Love”.